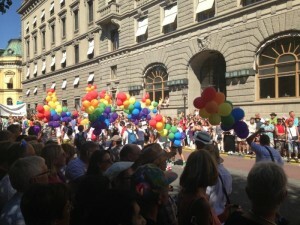 Practically all of Stockholm showed up this Saturday, August 3, 2013, to support and celebrate Sweden’s LGBTQIA community. According to Stockholm Pride, the parade’s organizers, this year’s Pride Parade was the biggest ever, with 60,000 participants and 600,000 spectators. (Stockholm Pride) Considering that Stockholm city has around 850,000 inhabitants downtown, it’s no wonder that it felt like all of Stockholm was there! My favorite part was the ”Proud Parents of homosexual, bisexual and transgender children” group. It was touching to see so many parents supporting their gay, bi and trans children. When they walked by us in Kungsträdgården, the crowd absolutely erupted into cheers and whistles. They were by far the most popular group in our viewing area. This group is organized through RFSL, and you can read more about them here. Having just gotten back to Stockholm from vacation in the US, this was a great way to start August. It’s exciting to see so many people come out and celebrate in the name of respect and inclusion. Good work Stockholm in supporting LGBTQIA rights!